Every knob, slider, or button on the Impulse that actually sends MIDI data is represented here. 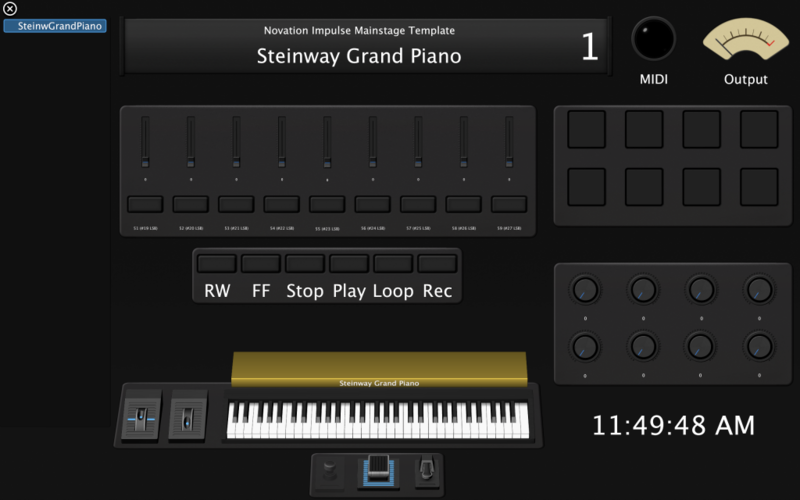 There are several more buttons on the keyboard itself, but they are for controlling the keyboard and aren’t linked to any MIDI channels, so there was no reason to put them on this template. The only thing extra is a foot switch to the left of the expression pedal. This is for my own use with my rig, but you can find ways to use it I’m sure, although it will require another device (Nord Electro for me). I’ve included a MIDI in light, as well as a VU Meter attached to the main output. Also, since I had some free space in the lower right hand corner, I included the time so you have no excuses when you say “Do we have time for one more song?” No, you don’t. The answer is always no. There wasn’t really enough screen real estate to make this look visually the same as the front panel of the controller without making things way too small. I thought spreading things out like this makes sense. If you come up with a better solution, send it to me so I can see what you did. Also, this is obvious but this would make a great starting point for any controller, whether it’s an Impulse or not. If you modify it for another device, share the link here! This is my first time sharing a file in my blog, so let me know if it doesn’t work for some reason. And, obviously, you’ll need Mainstage (specifically Mainstage 3) to use this template. I’m glad it helped. I’m working on one for an Arturia KeyLab 88 too. I am very new to Mainstage 3 and would find it very helpful to find a Yamaha MOX8 template. I especially want to assign MS3 patch volumes to the knobs on the MOX8. Any chance you could come up with a template? Also, go ahead and give my template a shot. It could work pretty well for the MOX8, at least as a starting point. Thanks, Mason. Does this require the MainStage setting on the Impulse’s hardware templates? Or General MIDI? You can use either mode on the Impulse. My template works either way. Depending on the mode you choose, different things will happen to various knobs and faders. I haven’t tried all the options. Good luck! Thanks for this! Can’t wait to try it out. I’m a novice when it comes to MS and my Impulse 61. Forgive my ignorance, but am I correct in assuming it’s possible to do things like: 1) layer more than one sound and control the layers from the faders on the Impulse? ; 2) easily change between pre-selected MS sounds from the surface of the Impulse? Thanks! Yes, those things are very possible. This template just gets you started by setting up all of the knobs, buttons, and faders to mirror the Impulse. Once that’s done, you are ready to dive in to learning MainStage. The internet has tons of resources for that. Check it out! And I’m glad this template is helpful for you. 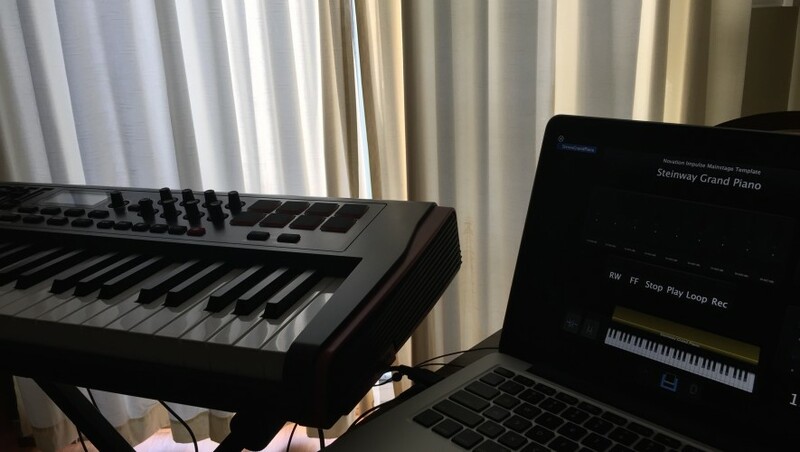 Thanks Mason – I’ve finally got it set up and am trying to play around with it today. Time to dive into some MS tutorials! Fingers-crossed! Question: I noticed there’s a setting for Mainstage preprogrammed in the controller… with this template should I keep the Impulse on the general midi setting, or use the one labelled Mainstage? You’ll see I answered that question for someone else. You can use it either way. Good luck! Hi Mason – your template is working out super well, and I feel like I’m finally learning my way around both the controller and MS. So once again, thank you! Last question from the “midiot” over here: I’m not having any luck getting MS to receive tempo from the Impulse. I’ve set MS to “get tempo from MIDI input” at the concert level, but it’s not receiving the time code (or whatever). Maybe this isn’t possible, and I’m wasting my time (would be useful to know! ), but any insights? Have you found a way to use the built-in tap tempo function (shift+roll+d5 pad) on the Impulse to send tempo data to MS? You got me on that one! I haven’t messed with any of the time code or tempo stuff. Hopefully someone out there on the interwebs has an answer for you! Good luck. I’m glad the template is working out well for you. About to try. You were the first thing google brought up lol, so there has to be some credibility here right?!? Lol. Thanx in advance. Hey, I just wanted to say I’ve been using your template(with a few tweaks) for almost 2 years now. I never got around to saying thank you. This template was a huge help in setting everything up without having to think too much about things when I first started out on Mainstage. To this day I really appreciate you posting this on here, and I was able to stumble on it through a google search. Wow, thanks a ton! That’s great to hear! When I first got the Impulse I scoured the internet and no one had done a template! I dug in and did one myself and am happy to have been able to share it with folks like yourself! Use it well! Hello, I’m looking for some help with MS3 and midi mapping/assigning controls and basic setup for an Impulse 49 I just bought recently. Is there a process where I can use this template and map the pads to play/stop samplers without the pads being assigned to notes simultaneously? Any help/tips are appreciated. Blessings.